The 88 is the presumed O-rating of the replacement player, and the 65 at the end is the constant for possessions in a game. These days we'd probably want to use something more like 68 to account the tempo-frenzy unleashed by the 30-second shot clock. Arguably, we could also increase the O-rating of the replacement player to account for increased average efficiency since 2009, but I'm leaving it at 88 because the Chinese consider 8 to be a very lucky number and my mom was born on August 8th. Overall, this list tracks common sense reasonably well. 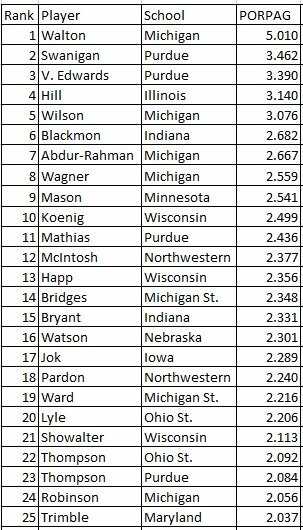 Walton and Swanigan are pretty clearly the top two offensive players. And most of the other good offensive players in the conference make the cut. But one thing POPRAG definitely misses is a fundamental basketball fact: it is harder to be efficient at high usage than it is to be efficient at low usage. Because PORPAG doesn't account for this basketball fact, it shows a clear bias for lower-usage high-efficiency players. This is how you get a guy like Abdur-Rahman (16.6 % usage) over Ethan Happ (28.9 %). Between 10% and 30%: 93 down to 83 on a sliding scale. Some of the more unsatisfying results of PORPAG are noticeably diminished. For example, Nigel Hayes appears at 25th and Zak Showalter drops out from 21st—as it should be. Showalter's dominance of this metric earlier in the season was what first got me thinking about this kind of adjustment. Other high usage guys like Jok, Happ, Ward and Trimble all move up significantly, better reflecting their offensive value (I think). While still not perfect, my subjective take is that every difference between the PORPAG and PORAGATU! is pro-PORPAGATU! Again, not perfect, but a pretty decent proxy for offensive value in my opinion. Got a better idea for how to make the high usage adjustment? Let me know. If I change the formula, I'll update this post. I'll also put up a PORPAGATU! page on the T-Rank site when I get a chance. Instead of using the sliding scale to adjust the value of a replacement player, I will just use the player's "usage-adjusted O-Rating" as the basis for the formula. That is calculated as: O-Rating + ((Usage - 20) * 1.25). In other words, add or subtract 1.25 points for every point above or below an average usage of 20. For these purposes, I will also adjust a player's O-Rating for the level of competition he has faced. This is done by comparing the average adjusted defensive efficiencies of his opponents versus the overall average defensive efficiency. So if the average efficiency is 103, and a player's opponents have an average adjusted defensive efficiency of 100, his O-Rating will be multiplied by 1.03 (103/100). Because usage is now accounted for in the player's O-Rating itself, it is not necessary (or proper) to include usage later in the formula and the total result must be divided by 20 to maintain the same scale. Because I can, instead of using a constant for the Tempo adjustment I'll just use whatever the average D1 tempo happens to be at a given moment. I've added the results of this to the 2018 Team Pages on the T-Rank site, and I hope to roll them into the rest of the site soon.